Home >Notice Board >Important Notice – We do not charge any subscriptions or subscription fees from our subscribers even we never ask any donation by email. I am very happy to inform you that there is no subscription fee on our website, You can use our question answer completely free. So if you get any email from our official email, please do not give money and let us know as soon as possible. I would like to inform you this because I received an email yesterday. They have emailed me by using our offial e-mail and claimed 776$. This is a scam email. We do not charge any subscriptions or subscription fees from our subscribers even we never ask any donation by email. Keep trust on answers mode. 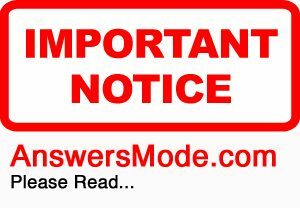 Ask questions, get answers, find information and share your experience with Answers Mode.